It’s September, but that doesn’t mean that the best of the fresh produce is behind us. I can’t get enough Brussels sprouts at this time of year, so I’m using them in any way I can dream up. 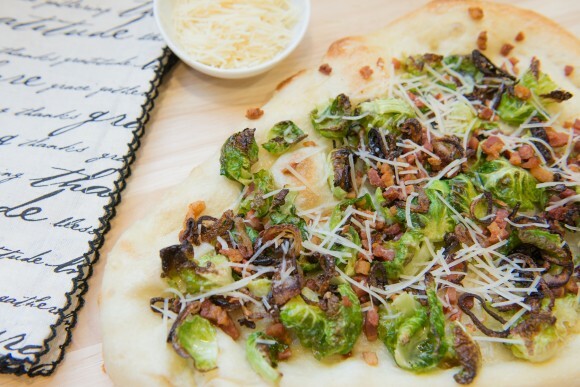 This weekend, that meant Brussels sprouts, pancetta and crispy shallot pizza. This amazing dish will be in heavy rotation at our house this fall! Lightly flour a baking sheet and shape pizza dough. Brush pizza dough with olive oil, then sprinkle with kosher salt and pepper. Set dough aside. Rinse and drain the Brussels sprouts. Cut about ¼ inch off the stem end of each sprout and peel off the leaves. When they become difficult to peel, trim off another ¼ inch and continue removing leaves. Repeat the process until you have peeled off all the leaves; discard cores. Heat oil in a large nonstick skillet over low heat. Add shallots; cook, stirring often, until golden brown, about 12 minutes. Remove with a slotted spoon and transfer to a paper towel-lined plate and season lightly with kosher salt. Increase the heat to medium high and add Brussels sprout leaves. Saute until the leaves are bright green and slightly wilted but still crunchy, roughly 3 minutes. Transfer leaves to a paper towel. Meanwhile, heat a small pan over medium low and sauté pancetta until crispy, approximately 5 minutes. Transfer to a paper towel to drain. Sprinkle pizza dough with ⅓ cup Parmesan. Top dough with Brussels sprout leaves, pancetta and shallots. Remove pizza from the oven and sprinkle with remaining parmesan cheese. small momentsin these small moments <Loved it! writing, in my view its actually amazing designed for me.